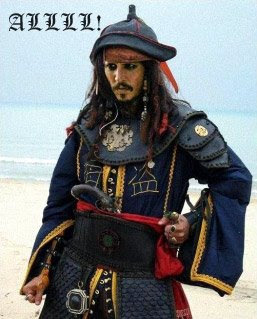 Does a Chinese Pirate say Arrrrgh? or Alllllgh? Blu-Ray bootlegs.. it was only a matter of time! As noted in this WSJ story.. pirated Blu-Ray discs are showing up in China. Law enforcement in Shenzhen, China, raided a warehouse last month that contained HD copies of a number of popular movies. Over 800 discs in fake boxes, and holograms to make them look legit. The Chinese Blu-ray knock-offs run as little as $7 apiece (compared to the typical Blu-ray disc at $30+). The process involves ripping high-def movies (cracking Blu-ray's AACS and BD+ encryption in the process) and re-encoding them using AVCHD, which offers a 720p picture. Because of the reduction in resolution, files can be burned to regular DVDs instead of the more costly Blu-ray discs, can you say profit!?. Interesting, the BD+ encryption scheme has only been out a little more than a year and a half. BD+ is the DRM protocol used to protect Blu-ray discs. It makes use of a small virtual machine environment to enforce compliance. BD+ was considered much harder to crack than the encryption used on HD DVD discs. Some crafty programmers at work here. Wont bore you with the technical details, but if you're a code/hardware person you'll find the comments in the Slashdot URL thread an interesting read!